TGIF! Today I thought I’d share another winery we visited last week while in California. This place is called Schramsberg Winery located in Calistoga, California. Last weekend while my husband and I were in Napa with some friends, we visited 4 wineries. Really that’s all we had time for! We had appointments at two places that required reservations and the other two were last minute drop ins. On Wednesday, I shared with you our favorite winery, Viader. The wine and the scenery are top notch. This is the scene from the deck of Viader. Stunning, yes? Schramsberg was founded in 1862, by Jacob Schram. It went out of business for about 50 years then was reopened in 1965 by Jack and Jamie Davies. Today they are considered one the premium brands of sparkling wine in California and match the production style of French versions and is the first U.S. wine to “Match the style and quality of the best French Champagnes.” (Per The New York Times, 12/6/95.) The winery is currently operated by the Davie’s younger son. This is how they store the freshly made sparkling wine. As the fermentation process evolves, sediment is formed in each bottle. So to prevent the sediment from sticking to the sides and look unappetizing, they store the bottles neck down to allow the sediment to settle near the opening. Every few weeks, the bottles are “riddled” meaning twisted in one direction or the other in the holder at an angle until all of the sediment gathers at the neck and can be removed. We learned that the person that oversees this process of turning of the bottles is called a “Master Riddler.” Trust me, we had a lot of fun with this. This is one of three beautiful oak barrels we saw underground at Schramsberg. Can you see the stacked wine bottles behind? The number of bottles of sparkling wine they store on sight is staggering. I thought the carved barrels were so cool. 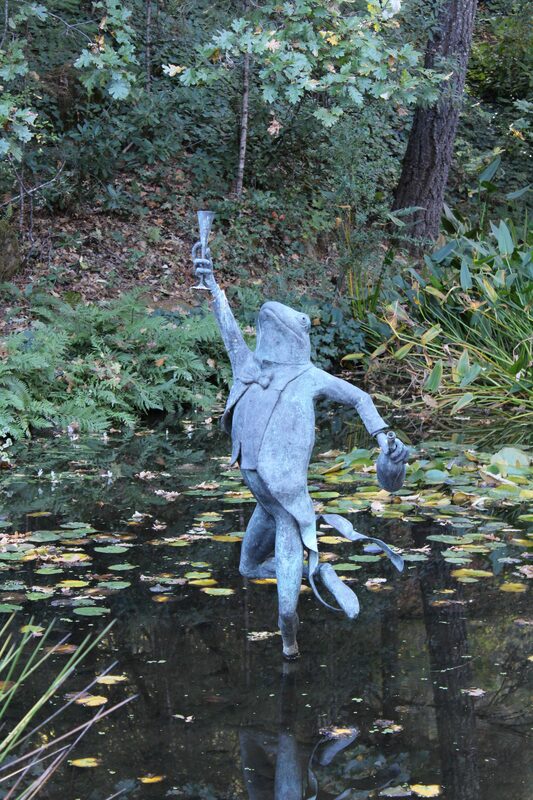 And this amazing frog-gentleman greeted us on the way into the winery. The frog is their insignia on their apperal, sort of like an alligator for Izod. If you choose to order from Schramsberg, they will gladly ship to most states. They also have a club you can join so you can receive their delicious sparkling wines several times per year. We just ordered a few bottles, so I can highly recommend their wines! Can I say they make the champagne of sparkling wines? Probably not. Legally. But, it’s mighty good! **Disclaimer-I tried to get my information right in this post, so I googled a few of the names, dates and facts and try to give credit where credit is due. Much of the information is from memory so I tried to be accurate. My goal is to share with you my experience and some lovely pictures and encourage folks to go to Napa and help revitalize their community after the devastating fires. I hope you enjoyed it!